Long term analysts of portfolio theory, especially with respect to the well-known ‘Permanent Portfolio’, named by Harry Browne many decades ago will be particularly pleased with the performance of physical gold over the last six months. In that time, gold has rallied from its summer lows of $1175/oz to almost $1300/oz, over 10%. In that time, equities have fallen between 12-18% depending on the country. Gold as the popular safe-haven with typical inverse correlation to equities has seemingly done its job again as portfolio insurance. Old Harry will be cheering from the grave, the ‘Permanent portfolio’ or sometimes known as the ‘Cockroach portfolio’ with its 25% allocation to cash, bonds, stocks and gold has survived this sharp downdraft admirably. Considering that this year’s US stock market saw the worst December since the Great Depression of 1931, this is no mean feat. Playing Devil’s Advocate though, this is potentially far too ‘data-fitting’ for want of a better phrase than the fact that gold remains locked in a very confined trading range. Gold in 2018, started the year just north of $1300/ oz, rallied briefly, before falling in the seasonally poor spring/summer period, before reversing course upwards, again on typical strong up seasonals in the second half, often attributed to Indian wedding patterns and other festivals. But for all the fanfare, gold is down a small amount on the year, investors have lost money and it seems a case of ‘Move on, nothing to see here’. When we look at the bigger picture of the longer-term monthly gold chart, we can observe the long decade super rise of gold from the $250/ oz bottom, in 2001, made famous by ex-UK Chancellor Gordon Brown’s exceptionally poor market timing in auctioning off most of the UK’s gold reserves all the way to the $1900/oz high in 2011. A whopping almost eight-fold gain!! A normal market correction of 30% until 2013. Since then we have effectively sat in a 200-dollar range straddling $1300/ oz going nowhere fast in five whole years, rather like the stalemate trench warfare of WW1. We have had zero interest rates, ludicrous monetary policy worldwide, coupled with very worrying political changes in many western countries with random events like Brexit thrown in and yet gold still treads water. The fact that arguably very few if any gold mining companies can make long-term profits at this price point seems to go unnoticed as well. Take a look at any gold miner’s retained earnings’ history and you will weep as an investor. The lack of exploration expenditure which has dwindled to almost negligible in recent years must have a potential to see a cliff drop in production in future years. Yet, still we wait, wary of more false dawns like the last six months. One of our strongest trading tools developed over the last 35 years, is the Trend Index, usually on a rolling 180-day count. In the simplest terms, it measures how coiled the asset class has become and how much potential for a new sustained trending movement. Currently, on the much longer monthly Trend Index, gold has been coiling for the last five years, time is running out for the range trader and 2019 may well be an explosive year. As much as we can show that technical aspect of the market independently of other asset classes, it is very clear to us that the equity markets, especially in the US are in a very precarious state. 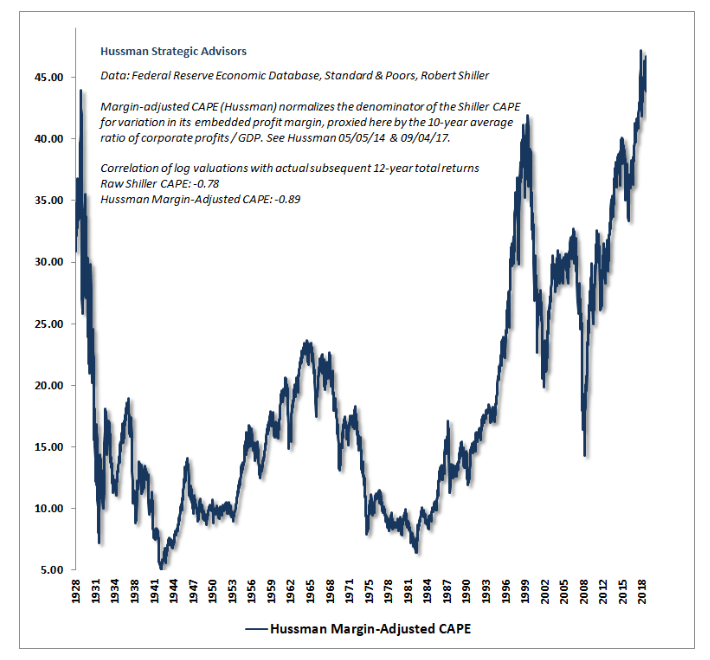 Even despite this ‘small’ recent sell-off, valuations on most metrics that we have found reliable over a long history, the possibility of a huge stock market crash look to be much higher than most believe. The fact that since 1987, every crash has been met with a 5% interest rate cut to add liquidity and that is not possible today from the current low rates suggests that the crash might be the biggest ever. In that case, the argument for gold and T-Bills making up a large part of your portfolio currently is very strong and investors ignore at their peril. As we enter 2019, now with longest economy expansion in history, the case for a potential contraction with an accompanying stock market crash is not insignificant. At this juncture, we believe the argument for gold and T-Bills making up a large part of your portfolio is very strong and investors ignore at their peril.